This year started with much promise. It was the best start to a year since 1997. Everybody was excited about the amount of money they were making from the stock market. And we were all “geniuses” for staying invested during that surge higher. Then something happened — the stock market entered a correction. But whether you rode out the market ride, dumped your strategy and started day trading, or went to cash, I have good news — the market correction is over. And while it didn’t last too long, corrections usually last for just a month or two. It was a turbulent market. So I want to congratulate you on surviving the first market correction in nearly three years. Now let me explain why it’s over, and how you can profit. There were plenty of rational reasons for a correction — profit-taking, rising interest rates, trade worries, etc. But the one thing that will lift the stock market out of a correction is earnings. 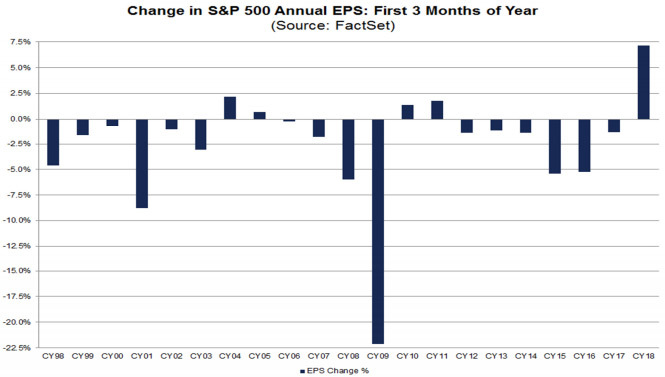 And if you look at stocks that are in the S&P 500, and how they did on earnings over the first three months of the year — you wouldn’t have guessed the market went into a correction. According to FactSet, we saw the highest earnings growth in a quarter in seven years. There was a record-high number of companies issuing positive earnings guidance. And earnings estimates, what analysts expect a company to report, increased for the first three months by a margin that is off the charts. Going back to 1996, when FactSet began tracking the data, the highest percentage increase in estimates for the first three months was less than 2.5%. For 2018, it was 7.1%. This doesn’t look like these companies are headed to the next recession just yet. As you can see in the chart, strong increases to earnings, like in 2004, 2010 and 2011, didn’t signal a market crash was just around the corner. Instead, it was the start of the next significant move higher for the stock market. And that’s why I consider the stock market correction officially over. Today is no different than the last couple of times this happened. And it represents an enormous profit opportunity. All you have to do is continue with the strategy that has made you money in recent years — because it’s going to work again. See, investors sometimes go through market corrections and bail on their strategies that have made them tens of thousands of dollars over the last few years. They do this because when the market gets extremely volatile, different strategies may work better for a short time. But now is not the time to give up on your strategies. They are going to continue working for you. And that’s the underlying message I want to share with you. Because the market correction is over, you’re going to want to be invested now. I have a service, Quick Hit Profits, and it’s designed to benefit from certain earnings announcements. I just finished telling its readers two things — this bull market isn’t over, and the opportunities coming up are going to be remarkable. I can’t wait for the money we are going to make over the next three months, and I want you to be prepared to profit.